OLE DB provider "SQLNCLI10" for linked server "LinkedServerName" returned message "The stored procedure required to complete this operation could not be found on the server. Please contact your system administrator.". Cannot obtain the schema rowset "DBSCHEMA_TABLES_INFO" for OLE DB provider "SQLNCLI10" for linked server "LinkedServerName". The provider supports the interface, but returns a failure code when it is used. Then most probably you are trying to link a new SQL x64 version with an old SQL 2000 x32 Server. The error happens as when the new SQL Server x64 version is trying to run the distributed queriy on the linked server it uses the stored procedure which is called “sp_tables_info_rowset_64” which is definitely not on the old x32 versions but if you do the other way around linking the old to new then it works as it calls the “sp_tables_info_rowset” which is already on the new x64 versions. 1. The easy way which resolves the problem immediately and only that problem. To fix the issue just add the stored procedure “sp_tables_info_rowset_64” on the old SQL Server Database and things should work fine. 2. 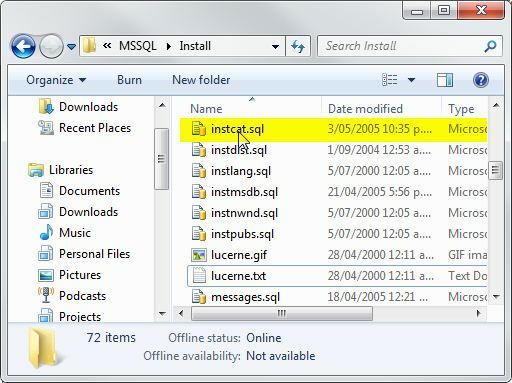 Now if you want to do the proper way you have to manually run the script called instcat.sql which you can find at the “<SQL Server Installation Path>MSSQLInstall”.